Unity is sometimes a buzzword in modern Christendom. Wielded like a cudgel to silence dissent, unity has become a twisted shadow of what God Almighty designed it to be. The reality is that most simply do not like confrontation so in any effort to avoid it, they will fall back on false notions of unity without bothering to ask themselves to what are they unifying with? Communion and fellowship were not meant to be taken so capriciously by the body of Christ. The age old question of whether or not we are supposed to be our brother and sister's keeper is still a resounding yes. Like the blood of Abel cried out from the ground as witness against Cain so too does the blood of those hurt within the church system cry out against the other members who turn a blind eye to their suffering, pain or loneliness. Today we will walk through the three steps of truly understanding division within the body of Christ so that real unity is pursued instead of the silo-church we see today. The first thing we must understand is found in the first key verse. We must understand who are our brothers and sisters in Christ. 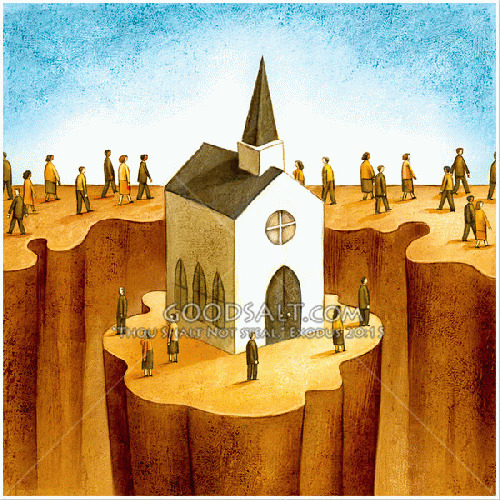 With the advent of the purpose driven church model many have fallen for the ruse that the church is the building they go to on Sundays and thus anyone in that building is therefore their church family. No beloved. Narrow is the way that leads to eternal life and few are those who find it. Standing in a church doesn't make you a Christian anymore than standing in a garage makes you a car. To make this point abundantly clear, we see this story in Matthew's Gospel where the actual mother and brothers of Jesus were trying to get in to see Him. His response is not meant as an accusation towards His blood family but rather a statement for us all to take to heart about our eternal family. Who is my brother, sister and mother except he who does the will of my Father in heaven? This is not a call to abandon earthly familial ties but a reminder of what family we now belong to and what delineates our family members. It is not who sits in the pew next to us by default. It is also the sheep cast out into the wilderness, hurt by the very building many worship instead of God. I have seen far too often in the local church this phenomenon play out. Decades of friendship and fellowship tossed aside because people no longer attend the same church building. Beloved it should not be so. As Jesus teaches us, can the eye say he does not need the hand? Can the head say he does not need the feet? The answer is still no. How readily do we accept a gospel and teaching different than what we have been given? There is a reason why Paul says let anyone who does so be accursed! These are serious matters beloved and we ought to be vigilant only unify around the truth with those who are doing the will of our Father in heaven. Lastly we get down to the personal level. The first two points were more global in nature, speaking to matters of obedience and doctrine. The reality is that as important as these are, so are individual people. Jesus goes to great lengths to teach us about how we are no longer individuals but part of one body. Yet far too often the eye is saying they do not need the hand after all. Maybe not out loud in declaration but in silence and exile. We are all called to a role in the body. The hand might be more creative. The eye may be more watchful. The feet may be swifter to carry the Gospel. The ear may be trained to spot what is false and keep the body pure and undefiled. That is why we need each other. That is why casting one aside is foolish. The eye cannot hear and the ear cannot see. As the third key verse says, in that way we ought not to take sides against one another, even through alienation. Because behind the concepts of the ear, eye and hand are actual people. Real people with real feelings. People who the Bible says we ought to suffer with when they suffer and laugh with when they laugh. We are not bound by a building, an address, or even an individual pastor. We are bound by Christ and His Word. Who is my brother and sister except he who does the will of my Father? For I am only supposed to unify myself with those who follow the true Gospel of Jesus Christ and let anyone who brings a different one into the family be accursed. For in that way let the body of Christ not take sides against one another. Let us take care of one another. Remember one another. Laugh with one another. Suffer with one another. I pray that we start to really do this in the body because what we see today must grieve the heart of the Father and break the hearts of many Christians on the outside of a church building looking in.